The Ultra Pad super plus is both reliable and strong. An organic cotton top sheet provides softness & comfort whilst a cellulose absorbent core and bio-film base layer give extra secure reliability. These Natracare sanitary pads are over 92% biodegradable and contain no plastic, perfume or SAP. Most sanitary pads contain many synthetic materials such as polyprepylene, surfactants, plastics and chlorine-bleached wood pulp as well as the occasional synthetic fragrance and lubricants. These unsustainable materials not only pollute our environment but, according to many gynaecologists, also create irritating symptoms for women that are similar to thrush. 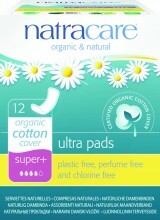 Always select natural sanitary protection. Click the button below to add the Natracare Ultra Pad Super Plus x 12 to your wish list.